Just as the last student left my Happy Hour Yoga class this evening, my daughter called from Portland, OR. I was just finishing up at my desk in the lounge, so it was perfect timing. I kicked back into one of the comfy Poang chairs in the lounge and had good long chat with one of my favorite people in the whole wide world. In one of my favorite places in the whole wide world. 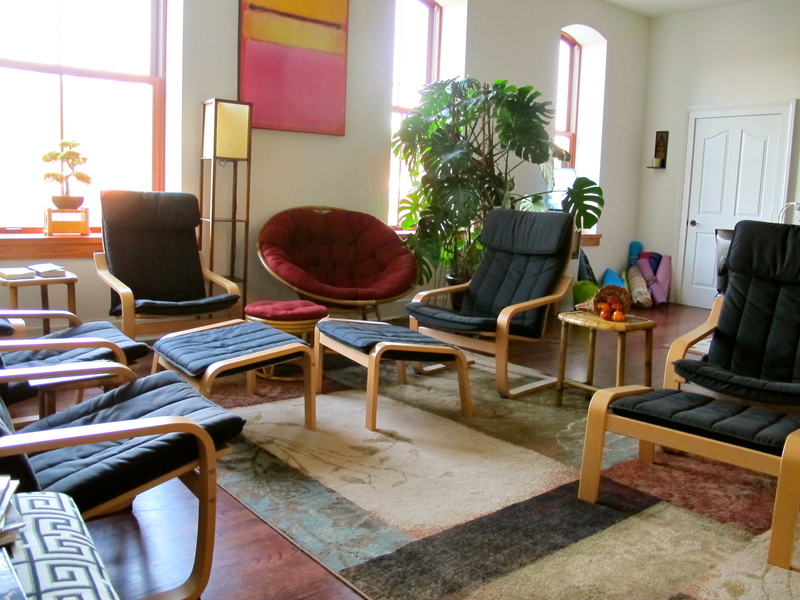 Here, for anybody who has never been to my studio, is the lounge where people congregate before and after class (and sometimes waaaay after class, to have great conversations, or to just shoot the breeze. The studio itself is in the next room and that is where all the transformational magic really happens. But a lot of good times have been spent in this room, too. If you’ve never visited, you should. We’ll drink tea, sink into the Poang’s, put our feet up, and just chill. Thank you for creating such an inviting area for us to enjoy and get to know each other. No. She’s a total social media drop-out! She lurks on her husband’s facebook page sometimes though, and she follows this blog, but otherwise she’s just having too much fun living the “vita loca” in Portland and managing her own Starbucks store in the land of bikes, micro-brews and indie music. Bummer. Well, because she allegedly follows your blog…HI EMILY!!! HulaGoofy/Corporalita/FlowtationDevices/Jennifer misses you and just wants to say Hey! I kind of envy the girl, too. Aside from blogging, I’m on the verge of becoming a social media drop-out too. I feel imprisoned by it at times, and I kinda liked my life the way it was before Facebook came around. love YOU!!! Come back soon!